Zuma Slots - Review, Play & Learn How to WIN! Step 1: Stakes can be altered between 0.01 and 10.00 per line by clicking on the up and down arrows under the stake button heading. Step 2: There is a maximum of twenty pay lines that can be activated or deactivated to the players pleasure in this Zuma slot machine game. This can be done under the pay lines button. Step 3: Click on the green spin button to begin playing Zuma Slots. There is something terribly Aztec about this game, and it is doubtlessly named after the Aztec ruler Montezuma. Aztec themed slot games are old news unfortunately, and there have been so many surfacing at late that nothing really distinguishes this one from any of the others. In short, nothing really makes it stand out against its rivals. The game is boringly designed with the same old stone style borders, statue icons, high card symbols and many other uncreative drawings of long gone Aztec Gods. The Zuma Slot machine game just simply doesn't have anything any other Aztec games haven't already offered up before them. Three, four or five scatter symbols on a pay line will reward players with free spins, and the Zuma logo counts as a wild card which can be used to substitute any symbol with one you need to finish a combination, barring the scatter symbol of course. With 95.7% chance of success it does sound as though the game has something quite promising about it, but when that is compared to other slots, more specifically other Aztec themed slots it turns out to be no more special than the design, layout or icons. The sound in the game makes it worse than it actually already is, with simple stone blocks being dropped and cheesy tribe chants, which sound more Native American than Aztec. This just won't do for something that could have potentially been so much more, with a little more work. The Zuma slot machine has a gamble feature which can be used to take a chance on doubling winnings, with a possibility of ending with nothing. 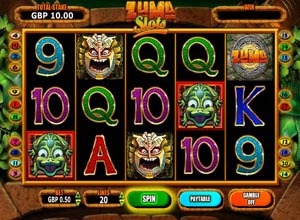 You can play Zuma Slots free by clicking on the Zuma Slots demo here at Lord Bingo.